Welcome on Brittany Seas Ships ! HSC Condor Liberation, Picture Antoine H.
Brittany Seas Ships was created by French ferries enthusiasts Antoine H. and Loïc P. under the name Transports Marins Bretons. 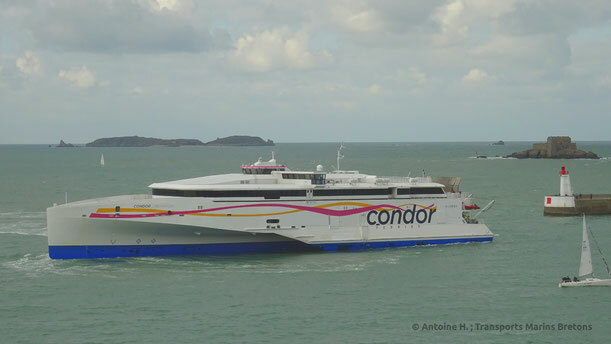 It was initially only a Facebook Page dedicated to the ferry companies that serves Brittany, and therefore it is dedicated to Brittany Ferries, Condor Ferries and Irish Ferries. It was then planned to create a website in French and eventually an English Edition which was released on 31st August 2016. 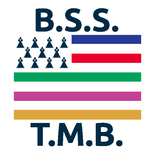 When the Translation Work began, it has been decided to give another name to the English Edition, and here comes the name Brittany Seas Ships. Brittany Ferries announces it will charter from Stena Line a third Stena E-Flexer class from 2023. The latter ship is however not going to replace Bretagne, which will be replaced by a purpose-built state-of-the-art cruise ferry. Pont-Aven in her new colours entering Saint-Malo harbour in February 2019. Picture Antoine H.
Although still being trapped in the uncertainty linked to Brexit, Brittany Ferries has announced a €8 millions profit for its 2018 financial year (which goes from Octobre 2017 to September 2018). 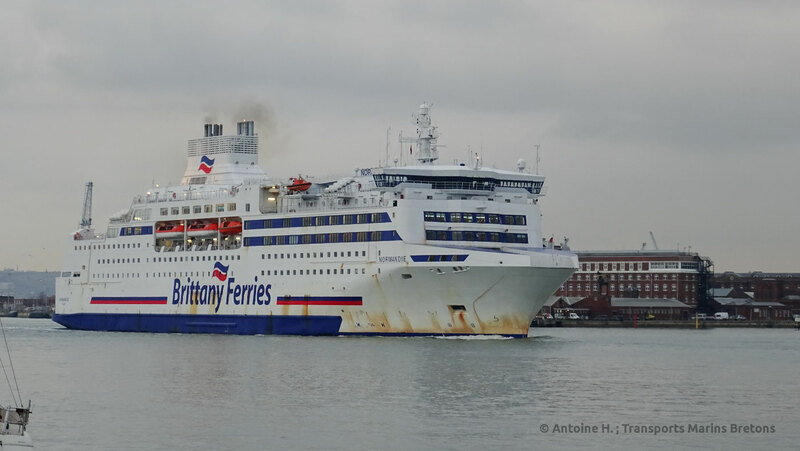 The Department for Transports has awarded a £46,6 millions contract to Brittany Ferries to operate 19 further weekly crossings from 29th March from Plymouth, Poole and Portsmouth in case of a without-deal Brexit. Brittany Ferries has just unveiled the first of its two-commissioned E-Flexer class RoPax ferries will be named Galicia and Salamanca. 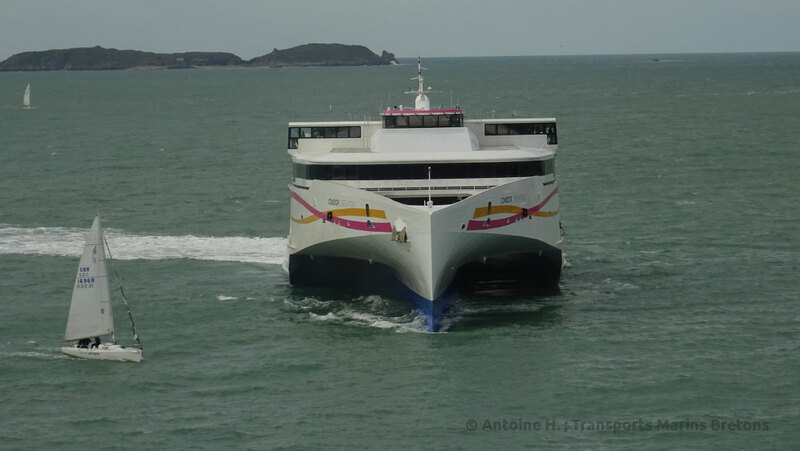 Brittany Ferries unveils today it has reached an agreement with Stena Line AB for the commission of a second E-Flexer class vessel, with the first (ordered a few months ago) to be delivered for Summer 2021, a year later than initially planed. As the her already-ordered sister, the new E-Flexer Class RoPax ferry will be chartered from Stena Line AB for an initial 5-year period with an option or purchase. M/V Connemara, a Visentini-class vessel which will be chartered to reinforce Brittany Ferries’s Irish routes. Courtesy Brittany Ferries. Brittany Ferries’ work horse Normandie began service back in May 1992, on the Ouistreham - Portsmouth for which she has been built. It mean she has kept sailing on this route for 25 years, up to three times a day with the reliability of a Swiss clock. Built to accommodate the growing numbers of passengers traveling to Normandy, she still looks very modern, despite her age. Willing to make something relaxing throughout a mid-August week end, we decided to make a cruise with Brittany Ferries. That was an occasion to sail aboard a workhorse we haven’t given the attention she deserves the last time we sailed on her five years ago. A travel report (text and pictures) by Antoine and Benjamin. Brittany Ferries has confirmed to our colleagues from Shippax it will charter from Stena Line a new vessel for its popular Spain - Great Britain route beginning 2020. Artist impression of M/V HONFLEUR, released on19th June. Courtesy Brittany Ferries. Brittany Ferries has announced during a press conference hold on 19th June it has ordered to the German shipyard Flensburger Schiffbau Gesellschaft its new state-of-the-art cruise ferry for its popular Ouistreham – Portsmouth service.